I’ve been doing a lot of baking lately (I’ve been making all the Superhero muffins from Run Fast. Cook Fast. Eat Slow.) so today I’m sharing the recipes for the apple cinnamon scones I made last weekend! Cranberries are one of my favorite dried fruits and I love this combination of cranberries and coconut flakes! You get just the right balance of tart and sweet, plus you can easily switch out the cranberries for your favorite dried fruit. Bring liquid to a low boil on the stove top. Turn down the heat slightly and stir in oats and spices. Cook for 4-5 minutes until liquid is absorbed and oats are soft. Stir in egg whites. 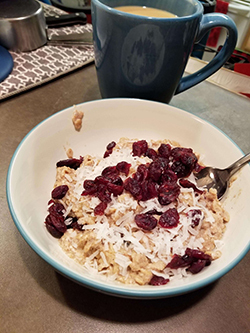 Let cook for about 30 seconds more, then put oatmeal in a bowl and top with coconut flakes and cranberries. Enjoy! The fall months are over and we are heading into winter. But before we get too far into December (and the cold and snow that’s coming), I wanted to share some of the most-read posts from the past fall months. As we head into winter, what do you want to read about on here? Leave me a comment! 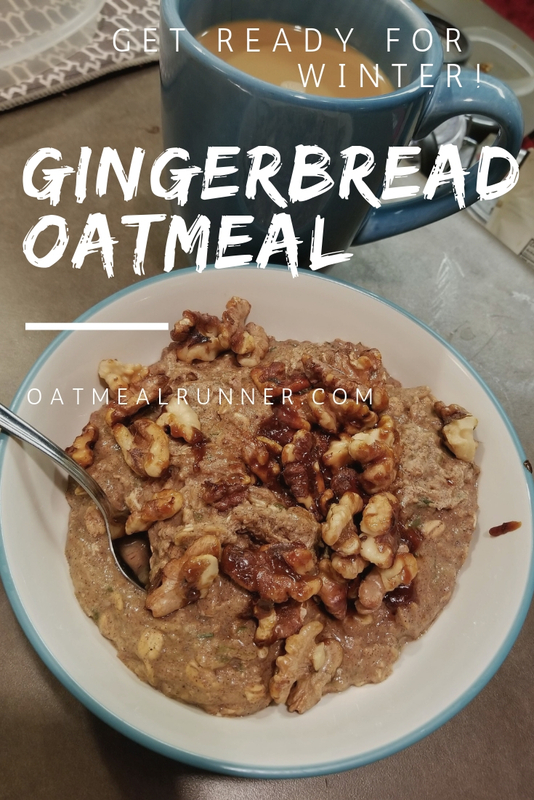 Gingerbread cookies are one of my favorite Christmas cookie flavors so I decided to recreate the flavor in oatmeal form! I added candied walnuts for some extra crunch and shredded zucchini to bulk up the oatmeal. I’ve been loving having this week as our temperatures have dropped below freezing in the morning. Turn down heat slightly and stir in oats, shredded zucchini and spice mixture. Stir in egg white and let cook for about 30 seconds more. Top with candied walnuts and enjoy!